Feeling Gratitude is the best thing for our Health! I write very often about the Power of Positive Thinking and about how important it is to keep our body vibration wave as high as we can. Our body vibration wave is crucial to our maintaining our good luck, manifesting positive experiences and staying healthy! To maintain a high body energy frequency we must maintain a positivity in our thinking and speaking. Complaining too much, being overly critical of others (and ourselves) is not good for our health or good fortune. While we can absolutely create a positive reality by maintaining a positive energy wave-sometimes things can happen that are out of our control. 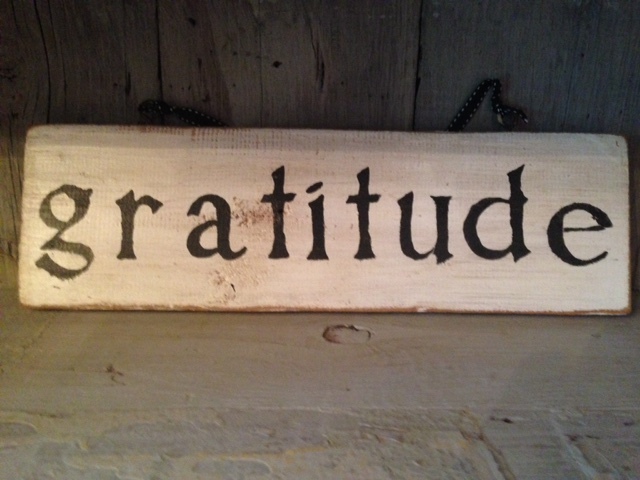 I believe it is these times when we can develop and cultivate our Gratitude even more! Recently, a huge old tree fell on my brand new car in our driveway. As inconvenient as it can be nobody was hurt and the house was not damaged. This could be a very difficult experience but it is important to find all the things we can be grateful for in regards to this event. For many years this beautiful huge, old tree stood outside our bedroom window. Once, many years ago, I was ill and this tree spoke to me and helped me heal. Yes, you can actually hear the trees and flowers, but your energy must be very slow and calm…anyone can do it. Remember we are surrounded by living, breathing, wonderful things. My family and I are filled with gratitude that this old tree did not hit our house and instead, leaned forward and just fell down on my car. One could say: “Why did this happen to me?” But, we can also understand that the tree was very old, weak at that point and the wind in this big storm, was simply stronger. No great mystery here. Be grateful everyday…find at least 10 things in your life to be thankful for. Every night before you sleep thank your body for helping you during that long day. Thank every organ , thank you eyes for seeing, your ears for hearing and your legs for holding you steady and strong. Wellness is a definite spiritual practice. Our lives are sacred as is every living thing around us. Be aware of how special and scared you are! Keep your energy high and Gratitude is one of the key secrets to doing that. It is especially important for our children to understand how to find Gratitude in each day. It is a powerful skill that will serve them the rest of their lives. Life is filled with unexpected challenges. However, perhaps the by product of our trials can be an enhanced sense of Compassion for others and a deeper sense of Gratitude. Thank you all and I am so Grateful to all of you for reading today!